First, it is a great idea to create a floor plan of the banquet hall to scale and place your tables in the space. You can include areas for a dance floor, bar, buffet, and any additional activities, but a floor plan layout is absolutely necessary. With a floor plan to scale, you can ensure you will have enough tables and seats for all of your guests while also having enough space for them to be comfortable. This should be done early in the wedding planning process, as the size of the reception hall will dictate how many guests you invite and how many tables you need. Once you have determined how many guests you are bringing, you can decide on the size and shape of your tables. Depending on the dimensions of your venue, you can choose between round tables spread throughout the hall of rectangular tables in long rows. Round tables that are six-feet in diameter can usually accommodate approximately 10 individuals, while eight-foot long rectangular tables can also accommodate 10 people if the ends are used. You may elect to have all of the tables surrounding the dance floor, or you may prefer to set up rows of tables with a dance floor at the front. Also, think about how you are serving dinner: buffet style dinner may be better suited to rectangular tables, while having round tables for served plates may be more convenient. Although it seems like a small detail, table size and shape is absolutely crucial in shaping the layout of your wedding, so put a bit of time into considering your options. Once you have determined your guest list and number of tables, you can opt for assigned seats, assigned tables, or a free-for-all seating arrangement. Assigned seats are ideal for serving specific pre-ordered meals, as it makes it significantly easier for the servers to find individuals. However, a buffet dinner may be better suited to assigned tables, allowing your guests to choose where they sit at their table, but giving the wedding more structure than a free-for-all. This way, you can place guests where you think they will have the most fun and be the most comfortable. Once you have determined your seating plan, be sure to make it very easy for guests to find their assigned table or seat. Create a visual map of the banquet hall with the numbered tables, and give guests a card with their name and table number upon entry. Often, the bride, groom, and wedding party are placed in the middle of the hall so that all the other tables can see them clearly. This helps accommodate speeches during dinner. When arranging the tables, try to think of your guests’ view of the head table. It is awkward and uncomfortable for guests who have their back to the head table during speeches, so try to arrange it so everyone has a clear and comfortable view. For more casual weddings, you can opt for a less structured seating arrangement, even foregoing the head table altogether. Regardless of your decision, always try to think of the comfort of your guests and your wedding party. Possibly the most important element of your seating arrangement is how you group your guests together to facilitate the most fun and conversation. To start, VIPs should be placed closer to the head table. Especially for weddings with dozens – or even hundreds – of guests, close friends and family members should be seated at a premium location. As the bride and groom’s closest friends and family, they are more likely to be involved in the wedding, which can help keep the event fun and social. Tables with elderly guests should be placed farther away from the band and closer to the buffet or washrooms. It also makes sense for the kids’ table to be near their parents, and your work friends or old college roommates should be placed by the bar or dance floor. If you opt for assigned seats, people are more likely to stay in their designated seat if they enjoy their table. Once again, just consider the comfort of your guests when making the seating plan. While some weddings can facilitate one or two entire “singles’ tables,” it is not always necessary to seat single guests together. Dispersing single guests throughout the other tables can be a fun way to mix up the groups and place people where you think they would have the most fun. You can also match individual guests with other groups of people that they already know – such as friends or family – so they are more comfortable. 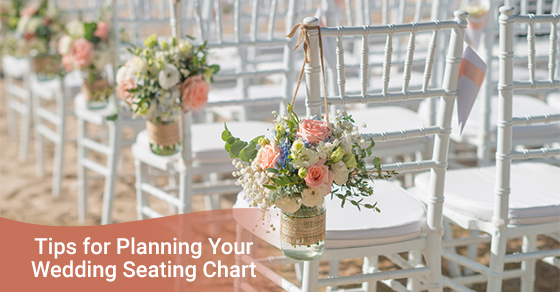 While planning your wedding seating chart can feel like the perfect opportunity to play “matchmaker,” just remember to try to put your guests where you think they would have the most fun. While the seating plan is a crucial aspect of any wedding, it is also important to have a banquet hall that can accommodate all of your guests and activities. At Chateau Le Jardin, we have a gorgeous wedding reception venue in Vaughan that can accommodate all of your wedding needs. For more information about our venue or our services, call us at 1-888-529-8573 or contact us here.